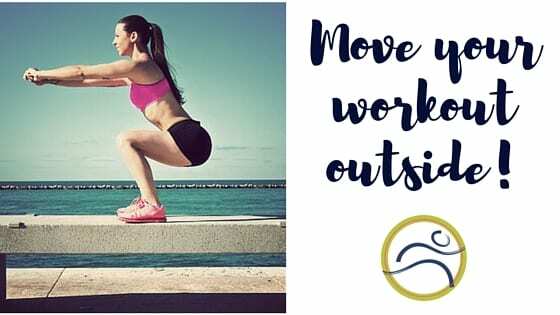 Leduc Physio - Physical Therapy and Massage Therapy ServicesPhysiotherapyKidsGet outside and try this workout today! Spring has arrived, it’s time to get outside. It brings back memories of mom yelling “get out and get some fresh air, it’s good for you!” Although this is usually a ploy for some peace and quiet in the house, she may not have been wrong. Research suggests that spending time outdoors has multiple health benefits. Decreased blood pressure, pulse rate, and lower cortisol levels (released when stressed) indicate that fresh air IS good for you! Since the sun has decided to stick around for a few months, why not take exercising outside? Here is a great workout to do outdoors, and all you need is a local playground! Plus, you can take your kids to play while you work out. Alternating Curb Taps: A quick movement that will pump up your heart rate with a fast switches of the feet. Atomic Push-ups: With your feet in a swing, bring the knees to the chest, extend back to a plank position, perform a push up and reset. Bench Jumps: Start in front of bench, in a wide stance and jump both feet entirely on the bench top, then step down. Bench Leg Raises:Begin lying on your back, with upper body and bum resting on bench surface. Raise the legs up and down to work the lower belly muscles, without allowing lower back to pull off of the bench (engage core). Split Squat on Bench: Take a large step away from the bench edge, place back foot up on bench (make sure front knee is not ahead of toes). Perform lunge with back leg raised on bench. Step Up with Knee Raise: A mix of strength and cardio that works the glutes and leg muslces. Assisted Boat Crunch: Use the bottom of a slide to assist your in-and-out crunch to tone the lower abs. Keep back straight and breathe! Hanging Monkey Bar Crunch: Hang from monkey bars, then tighten shoulders as you lift your knees towards chest. Hanging Side Crunch: Twist the knees to the side while keeping the chest square to the front. Inverted Row: Work your upper back, chest and core. Hanging from under a sturdy bar, get into a plank position with heels on ground. Pull yourself up, keeping your body straight. Work hard and enjoy the sunshine! Thanks to Amanda Palmer for photos.